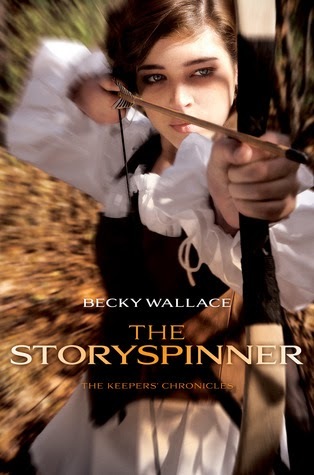 The Storyspinner is everything that I love in a Fantasy. With dual points of view, it could have been difficult to follow, but Becky Wallace masterfully weaves this story together, leaving you on the edge of your seat the entire way. Every character in this book was well-written and engaging. Often when books switch from one character to another, or from one storyline to another, I find myself impatient for one particular person to show back up. I didn't have that feeling at all this time. I loved everyone! Johanna is a fantastic protagonist. She's fierce and loyal. She'll do anything for her family (and often has to), and isn't afraid of hard work, or a fight when the circumstances call for one. She's a daughter, sister, hunter, Performer, and so much more. The romance is a slow burn, and so fantastic. I love the banter and the struggle to come to terms with their feelings. I loved that the romance(s) wasn't the forefront of the story, but added another layer to an incredible adventure. Then there was the magical element with the Keepers. Jacare, Pira, Leao, and Tex were so fun to read. I love their relationships with each other and their determination to find the princess. The magic they could do was different and really intriguing. This book wasn't anything like what I was expecting, and I'm so glad that I picked it up. I can't wait to see what happens in book two, especially with how this book just ended!! Well, since it's coming out next week and you love it Andye, it means I must have it :) I'm glad you loved it and I'm sure I will too. Not going to lie, I was a bit hesitant to read a review of a book I was planning to read. Some reviews can get spoilery. You just make me more excited for the book. I'm a big sucker for fantasy and I've definitely had my eye on this for some time. Yup! I am a real fan of anything of the fantasy genre! Thank you for the review! A great review than k you. Already on my radar.